H4 Work Authorization, Work Permit or H4 EAD and H4 Visa Issues: Can I go back to my H1B visa after I move to H4 visa status and work H4 EAD? Can I go back to my H1B visa after I move to H4 visa status and work H4 EAD? 1. There is time left on the H1B either before six years or if there is potential H1B extension beyond based on AC 21 104(c) or an approved I-140 petition. 2. There is a good offer which complies with the specialty occupation of the H1B visa. However, the person can only start using the H1B visa once it is approved not when the extension or transfer is applied. 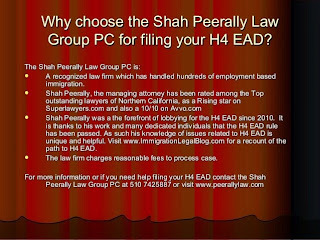 We recommend that before changing your status from H1B to H4 or vice versa, you speak to a good lawyer who can analyze your case accordingly. You can call us at 510 742 5887 if you need a consultation.